Strategic, well-written fundraising proposals are the lifeblood of most of South Africa’s estimated 150 000 non-profit organisations (NPOs). To meet this need, Inyathelo: The South African Institute for Advancement, recently held a proposal writing workshop at its offices in Woodstock, Cape Town (16 May). The one day programme was attended by 18 representatives of NPOs from Cape Town, Kwa-Zulu Natal and Gauteng. 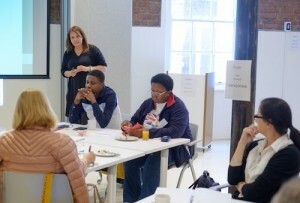 The workshop was facilitated by Inyathelo Associate Gillian Mitchell, who writes and trains in Advancement and philanthropy for civil society organisations and higher education institutions. Gillian previously headed up Inyathelo’s philanthropy work and has broad and varied experience within the tertiary education sector.